As I may have mentioned, I’ve been marking a few exam scripts recently. I probably shouldn’t specify which exams I’ve been marking, but suffice it to say that I’ve had plenty of time to rue the essay questions I and my fellow examiners came up with a few months ago. A colleague described exam marking to me the other day as like being neither alive nor dead, and that’s about right. An inalienable rule seems to govern marking that candidates will home in en masse on just one or two questions. Which questions they will be, you never quite know in advance, but you can be sure that by the end of the process there’ll be certain topics you feel you never want to hear or think about again. In 2014, for me, it’s pietas, a Roman virtue and the topic this year of a very popular question indeed. Pietas is the source of both our words piety and pity, and it’s a bit like piety and a bit like pity, but it’s best understood as a sense of duty (Jasper Griffin suggests it’s a sense of duty with added emotion, but I can get quite emotional about duties): a Roman man was pius if he honoured the moral duties he owed to members of his family, his country, the gods, and anyone else to whom he had incurred an obligation. The perennial question about pietas and Virgil’s Aeneid is whether, for all Virgil’s determination to associate Aeneas with this virtue, the hero really can be considered to exemplify it. This seems to be one of the deep issues posed by Virgil in his poem, since it concerns the morality of the Roman project itself: no wonder students are drawn to it; no wonder also that they struggle with it. So do I: on the one hand an absolutely iconic image of pietas is Aeneas stooping to carry his father on his shoulders, and clutching his son by the hand, as he makes his escape from Troy in Book 2. The hero proves his worth by sacrificing himself for the interests of his father and son, themselves embodiments of the future of his people and their past. A version of the scene (with the hero also carrying a talismanic figure of the goddess Athena) had featured on a coin of Julius Caesar: Caesar’s family legend of descent from Aeneas, transmitted to his adopted son Augustus, provided Virgil with the topic of his poem. On the other hand Aeneas’ pietas doesn’t always seem so secure. 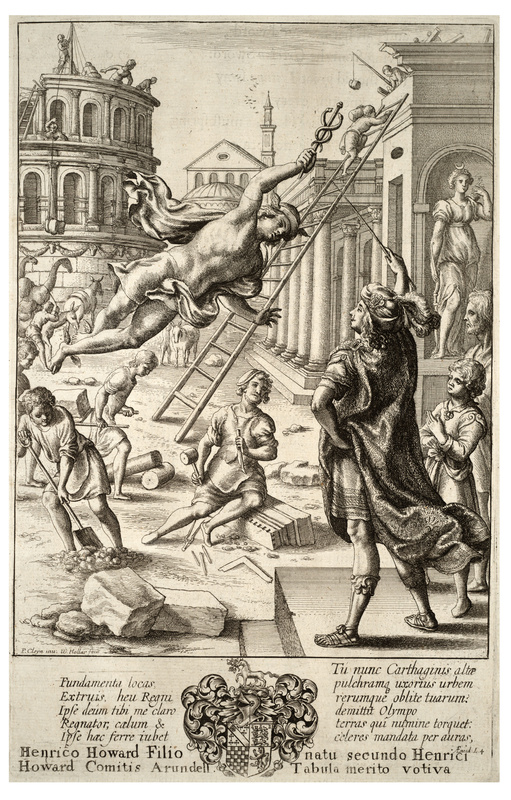 In Books 1 and 4 Aeneas allows himself to fall in love with Dido, queen of Carthage, and the god Mercury can present it as a dereliction of his duties to his son Ascanius, whose glorious future lies in Italy: Aeneas’ departure from Carthage, chivvied by Mercury (you can see a seventeenth-century realisation of the scene at the top of this post), is a reassertion of his pietas, to his son, his people, and his gods. That’s Mercury’s view of things, and an authoritative one, but there are other ways of looking at it. Aeneas’ leaving of Dido might also be seen not so much as a return to pietas on the hero’s part as a clash of pieties: Aeneas owes something to Dido, too (quite how much depends on whether you believe, as Dido does, that the couple are in some sense married). Well, if Aeneas’ abandonment of Dido already complicates the morality of Aeneas’ mission to found Rome, in the second half of the poem, when Aeneas has landed in Italy and is fighting a bitter war to secure the Trojan settlement there (the ancestor of the city of Rome), his pietas comes under intense scrutiny, and again and again, it seems to me, Virgil goes out of his way to place his hero in situations where an act of pietas can also be read as a contravention of pietas. One example comes in what may be the most disturbing stretch of narrative in the whole poem. In Book 10 Aeneas’ young protégé Pallas dies in battle at the hands of Aeneas’ rival Turnus. The loss of Pallas seems to send the hero quite berserk, and he cuts a terrifying figure, indiscriminately massacring his enemies, and even taking eight young men prisoner to sacrifice at Pallas’ funeral. This is a simply astonishing thing for the hero of a national epic to do, even taking into account the precedent set by Achilles in Homer’s Iliad after the death of Patroclus: human sacrifice appalled Romans as much as it would us, in fact the Romans thought of it as the kind of thing irredeemable people like the Carthaginians or the Celts got up to. But what’s weirder still is that, even as he departs from any kind of recognisably civilized behaviour, Aeneas continues to be honoured with this epithet pius. For example, when he vaunts callously over his dying enemy Lucagus, before mercilessly despatching Lucagus’ brother, the introductory formula to his speech takes an incredibly jarring form: quem pius Aeneas dictis adfatus amaris, “Dutiful Aeneas addressed him with biting words” (10.591). And if we think about Aeneas’ human sacrifice, this act of the most morally trangressive kind is being committed in the furtherance of pietas, the honour Aeneas owes to his dead comrade Pallas. The very depths of impiety are the last word in piety. Well, pondering as I marked the scripts, and sharing the bewilderment of the students, I went back to a strange and deeply intriguing moment in the work of Virgil’s contemporary, the elegiac poet Propertius. In the first poem of his fourth book Propertius talks of an oracle of the Sibyl at Cumae to the effect that “the land must be pianda (sanctified, literally “made pius“) by Remus of the Aventine” (Auentino rura pianda Remo, 4.1.50). The reference is to the myth of the foundation of Rome by Romulus, in the course of which (according to the dominant version of the story) Romulus slew his own twin brother Remus. What’s remarkable, terrifying even, about Propertius’ formulation is that it suggests the killing of Remus by Romulus was a pious religious act, a sacrifice at Rome’s foundation which would ensure the new city’s prosperity. We find a similar idea in the later historian Florus (Remus was “the first sacrificial victim, and sanctified the fortification of the new city with his blood”, 1.1.8), and earlier in Propertius’ poetry, where he talks of “the walls made strong by the slaughter of Remus” (caeso moenia firma Remo, 3.9.50). But if this is an act of piety, and a religiously sanctioned sacrifice is about as pious (or pius) as you can get, the killing of one twin by another twin is a comparably absolute trangression of the very essence of pietas, which is the observance of one’s obligations to kith and kin besides anything else. There is no closer bond of kinship than twin and twin. So according to Propertius, Rome was made pius by an act of unbounded impiety. What makes the story of Romulus and Remus relevant to the Aeneid is that it’s generally recognised that this alternative myth of the foundation of Rome is designed to be felt through much of Virgil’s account of Aeneas’ exploits. Specifically, the conflict between Aeneas and Turnus, only finally resolved at the very end of the poem when Aeneas kills the Latin prince, owes a lot, alongside its many debts to Homer’s poetry, to the account of Romulus and Remus in the epic poem Annales written by Virgil’s great Roman predecessor Quintus Ennius. It’s worth adding that at other points in the Aeneid there’s a disconcerting tendency for antagonists, Aeneas and another, to resolve themselves into a twin relationship, before one of them is eliminated: in other words, to follow the pattern of Romulus and Remus. That’s one implication, for example, of the gorgeous matching similes describing Dido as the goddess Diana in Book 1 and Aeneas as Apollo in Book 4. At first blush they suggest the compatibility of the couple, the surpassing godlike beauty of each partner to this budding relationship. But ponder things a little longer and you realise that Apollo and Diana are brother and sister, indeed the twin children of Leto. Not a good recipe for a love affair, after all. But Dido will also die, Remus-like, at the end of it. What the students find so difficult to make sense of is exactly this: that the hero Aeneas seems to be presented by Virgil as simultaneously impeccably pius and irredeemably impius. The end of the poem restages this dilemma in the starkest terms. Aeneas and Turnus fight their final duel, and Turnus falls. 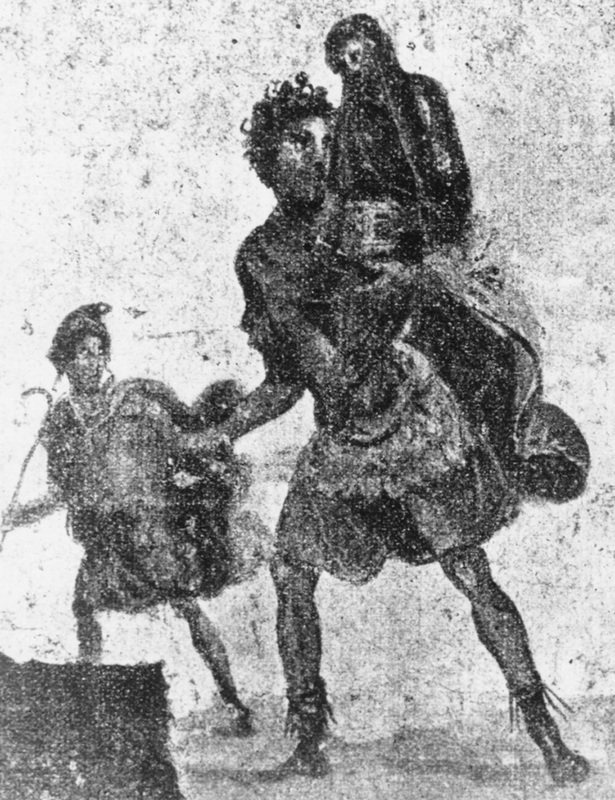 He admits his defeat and begs for his life; and Aeneas is inclined to grant it until he catches sight of a balteus, “shoulder band” or “baldric”, plundered by Turnus from the dead body of Pallas, the youthful comrade of Aeneas that Turnus had slain. In a fit of anger provoked by the sight Aeneas sinks his sword into Turnus, and the poem ends with his death. Virgil seems to have staged this final act very deliberately to draw out its contradictions. For example, Turnus talks of his own father (and mentions Aeneas’ father Anchises) as he tries to persuade Aeneas not to kill him, working on Aeneas’ pietas, his respect for the ties between father and son. It works, as of course it should with pius Aeneas, and the hero checks his impulse to strike the fatal blow; in this context Aeneas’ fatal burst of temper, which then overcomes these scruples, seems all the more inexcusable. Yet of course to respond as sympathetically as Aeneas does to the reminder of the man that Turnus killed, his comrade and protégé Pallas, and indeed to set out to avenge Pallas’ death at all, is pietas through and through. Whenever I read the Aeneid, what stands out for me is the extreme paradoxicality of its thinking. It presents us with violence that yields peace, brutality that is piety, poetry that is closely akin to malicious rumour, and I feel as strongly now as when I started working on Virgil that these illogical (in fact consciously mystical, I think) patterns of thought arise from the circumstances of the poem’s composition, the fratricidal civil war from which emerged the emperor Augustus and the (as yet, fragile) peace Rome was experiencing when Virgil wrote. “Fratricidal” is my metaphorical turn of phrase here, but it’s a metaphor the Romans also used of that dark period in their history. Indeed in the depths of the civil wars Horace (in Epode 7) traced what seemed to be Rome’s compulsion for self-destruction to its mythical origins, the fratricide of Remus by Romulus, the killing of twin by twin, with which Rome came into existence in the first place. The hero whose pietas is realised in acts of the utmost impiety, and Rome the city sanctified by an act unimaginably transgressive. Was Virgil suggesting to contemporary Romans through his theme of pietas that what applied in mythical history also applied in their own time, that only through the moral extremities of civil war could a new and prosperous Rome be generated? That in some deeply mysterious way Aeneas’ pietas consists in acts of impietas? If so, we’re in a very, very strange place. Thanks so much for this great post. Do you think the complicated portrayal of piety in Virgil could possibly be a precursor to post-modern thought? Virgil seems aware that an act deemed “pious” for one person (e.g. Aeneas killing Turnus to avenge Pallas’s death) is tragic and monstrous to another (e.g. Turnus’s family). The meaning of a pious act is determined by the family/culture/etc in which it’s located and not inherent in the act itself. What do you think? Thanks so much for this. I suppose my take on it is that Virgil presents situations that don’t divide opinion, so that X will approve and Y deplore, depending on their perception of it, so much as present each individual with a profound moral quandary. So it seems to me that the death of Turnus is set up so that anyone possessed of a conventional Roman ethical worldview would find it fundamentally challenging: it is both entirely right and entirely wrong, and is so from a very singular and very conventional Roman moral standpoint. In other words I think we’re supposed to see that sanctity and horror do both inhere in the very act of Romulus killing Remus, terrifying as that is. Fascinating. The Romans continue amaze me. Thanks again. A little off beam from your main points. When I read this last night I was struck by a sense of dualism and while at work today I have been wondering if it is too much of a stretch to pull Mark Antony into this. To re-found Rome, Octavian had to defeat Antony and in doing this there is perhaps a sense of parallel between the mythical founding and the Augustan re-foundation (this town isn’t big enough, Antony as Remus, Octavian as Romulus, etc…). In the context of the civil war they are both exceptionally close in relationship to Caesar’s shadow and in the immediate aftermath, it was Antony who would have been seen as the more natural choice of successor, almost family like Octavian (The way in which he so badly plays his hand to an utmost tragic ending is still quite incredible). I also had a further small thought. Aeneas, who puts duty before love and leaves Dido, to fulfil his destiny a consequence of which means her death. In the time of Virgil, is there a resonance with his contemporary audience about this story and the collective memory of the life of Antony? A potential re-founder of Rome who fell in love with a foreign queen, but could not (in a terribly Un-Roman/Un-Augustan(?) way) put Roman duty before his love for Cleopatra (or, depending on who’s telling the story; Antony’s weakness being the inability to resist this notorious foreign seductress. Something Augustus & Aeneas would never be guilty of doing, their piety/duty). Antony’s behaviour is an unforgivable betrayal of Roman duty and an act of impiety against the state bringing him, ultimately, to a deserving death. When Octavian leaves the battlefield of North African Egypt to return to Rome and re-found Rome as Augustus, another foreign queen has committed suicide in his wake. I buy all of that, Tony. Antony, and the choice between him and Octavian, must underlie Aeneas v Turnus to an important degree. If you think of Book 8, the fight between Hercules and Cacus is some kind of template for Aeneas against Turnus, but at the end of the Book, on the shield, the conflict presented is Augustus against Antony. So the threat of Antony is definitely felt in Turnus, I think. It’s Virgil, so complicated in various ways: in Book 4, yes, for as long as he’s building a city other than Rome in the clutches of an overpowering queen Aeneas looks very Antonian indeed. But even with Turnus, Augustus had insisted (as is reflected on the shield) that he represented Italy, his forces ranged against the strange eastern forces of Antony and Cleopatra. But who’s the Easterner in Virgil’s conflict, and who’s the Italian? It gets awfully hard to distinguish Aeneas and Turnus, I think. Thanks for taking the time to write!